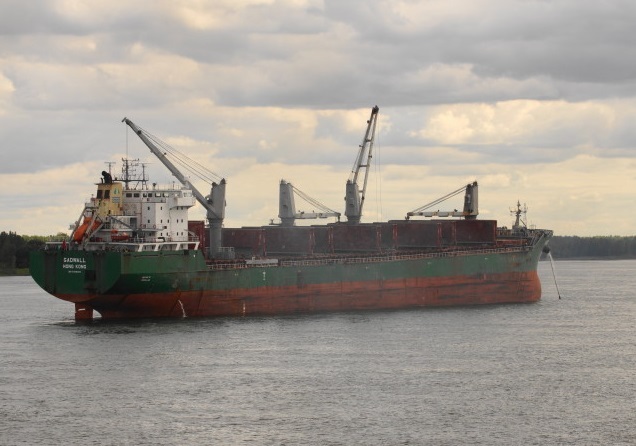 The bulk carrier Gadwall lost propulsion power after engine failure in Gulf of St Lawrence into the North American Great Lakes. The vessel was en route from Quebec, Canada to Ghent, Belgium, but after leaving the river and heaving to North Atlantic suffered mechanical failure and remained adrift. The ship’s engineers were unable to restart the engine power and reported the accident to the local authorities. At the scene of the disabled vessel was dispatched salvage tug Ocean Arctique, which towed the bulk carrier Gadwall to Sept-Ile in Quebec. The vessel will be repair and inspected before return in service. The local authorities started investigation for the root cause of the accident. Fortunately there were no sufficient accident and near misses during the blackout. The vessel was at high depth and has no option to drop an anchor. During the incident there were no injured people and no water pollution. The bulk carrier Gadwall (IMO: 9358369) has overall length of 200.00 m, moulded beam of 24.00 m and maximum draft of 8.00 m. The deadweight of the ship is 37,249 DWT and the gross tonnage is 22,790 GRT. The bulk carrier was built in 2007 by Xingang Shipbuilding in their shipyard in Tianjin, China.